Despite years of proven clinical expertise and an exceptional publication activity, the NoTube method of tube weaning is sometimes still criticised and inaccurately viewed. It is not always easy for parents and health professionals to separate truth from falsehood. We want to take this opportunity to look at things more clearly and respond to the most common rumors and misunderstandings that we have heard. Most patients who have received a temporary nutritional tube do not become dependent on the feeding tube in the long term. Once the intended nutritional or developmental goal has been achieved, most children who have been treated with a temporary feeding tube find their own way to oral nutrition thanks to appropriate medical and/or therapeutic support. Due to the financial restrain and distance to their place of residence, parents of affected children only turn to NoTube after all local treatment options are exhausted. Therefore, the cases with which NoTube is confronted are in fact usually the most complex cases of tube dependence, those that have been “abandoned” or “given up” as hopeless by their local teams. Some of these children have been dependent on their tube for several years and have developed a psychological and physical dependence. Still others have a very rare diagnosis or severe multiple disabilities, which complicates the tube weaning process too drastically for medical teams who are not specially trained to remediate. These parents wait in vain for the famous “click” or even have to deal with predictions like “your child will never eat.” NoTube is very often the last resort for those families who have already tried everything. Parents have often heard reports that NoTube has the habit of suddenly weaning children overnight from their feeding tubes. This is absolutely wrong! NoTube always reduces tube feeds gradually over several days / weeks and under close, daily medical supervision, and children are never put in danger or distressed. The weaning process is individually adapted to the slowly increase oral intake of the child. This approach is necessary because the aim is to enable the child to regain their eating habits, which have been withheld by the tube feeding routine itself. This includes a natural cycle of a gentle experience of hunger and its resolution: satiating through eating. The reduction is adapted to each child’s individual oral progress. The medical team monitors the child’s energy level and ensures that their hydration level is always guaranteed. Under these closely monitored conditions, the child can move independently towards oral intake of food. The golden rule is that the child leads the weaning process; their progress and reactions determine the pace, the approach, and the techniques. The NoTube method respects each child’s individuality and autonomy above all. In case of very slow reduction of tube feeding, the child´s metabolism can adapt to the lower energy input and no feeling of hunger kicks in. 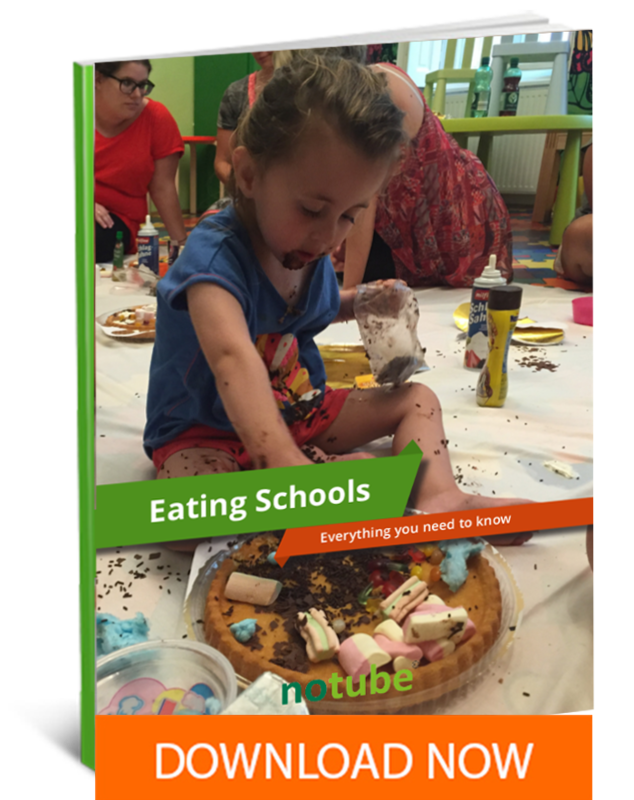 It is easy to understand why families accessing NoTube are tempted to describe NoTube’s work as miraculous when they have sometimes struggled for months or even years to finally get their child to eat. The reality is, however, that NoTube’s approach is not a miracle, but rather based on scientific and clinically evaluated method, executed by an experienced and interdisciplinary team on much more than thousand tube-fed children. NoTube’s success rate of over 90% is substantiated by research that was published in the Journal of Pediatrics and Child Health, based on a sample of 169 children treated in the Netcoaching program between 2009 and 2012. and compared to a sample tretaed with an in-patient approach. We continue to collect and publish dataa on our methods. Learn more about the results of NoTube under this link. Medical teams in Europe and around the world often want to adopt and implement the NoTube method and regret that they are not successful in employing it with their own patients. The application of this approach to enteral feeding and tube weaning in a traditional hospital is extremely difficult and often fails due to communication obstacles that, while banal in nature occur frequently and with extremely disruptive results. It is for this reason that spread our knowledge and experience, be it on this or many other blogs, on our website (with scientific resources), on our Facebook page, on our YouTube channel, or by participating in conferences all over the world and other important events in the field of pediatrics and eating disorders. Thanks to more than 30 years of clinical experience, NoTube can now look back on a unique “success story.” Its strength certainly lies in the multidisciplinary cooperation, good communication, and 24/7/365 availability we provide for our patients. It is important to note that NoTube is a non-profit organisation, that means that we are not allowed to generate profit from our services and that thus, our program fees merely represent the real costs of the treatment. The detailed costs for the services of NoTube can be found here in full transparency. Nowhere in the world does an interdisciplinary medical team work full-time and on a daily basis for free, yet NoTube is often criticized for the fact that its services cost something. We are a non-profit organisation, but our qualified employees of course receive a normal salary. As we often don´t even know the real costs of reimbursed medical services, several thousand Euro for a medical treatment sound like a lot. However, in order to acknowledge the costs of our program, we need to put them in relation to the costs of (for example) an in-patient tube weaning program, which, depending on the country, often costs more than 1000€ per day. As the health and insurance systems vary greatly from country to country, our services are often not or only partially reimbursed in other countries (As a sidenote, we would like to inform our readers about EU Directive 2011/24, which mandates all EU member states to reimburse necessary (planned or unplanned) medical services in other member states to the same conditions as in the respective member state. Please find details to your rights and your national contact point under this link). It is also important to remember that the use of a feeding tube is in itself very expensive and that weaning is, on the contrary, a much more interesting financial alternative for health insurance companies! It is regrettable that the “medical service” of removing a previously set medical intervention (i.e. tube placement) is not coded and is not perceived as a necessary service and this is one of the main reasons for the resistance from the service providers. Do not hesitate to give us your opinion, tell us about other ideas you have heard about the work of NoTube and about which you would like to exchange yourself. Whether here, in the blog or on the Facebook page, we are happy to advise you!